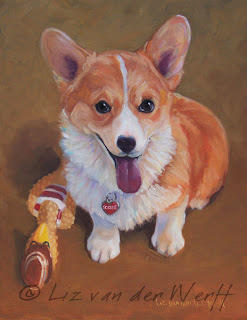 This is Sophie, an adorable Welsh Pembroke Corgi. "Sophie is beautiful Liz. I knew I would love her, but the photo hadn't done her justice. I'm sure you probably hear this all the time from others who have their pets captured on canvas as you have our two, but I don't know how you could have made her any more lifelike. Thank you, thank you! 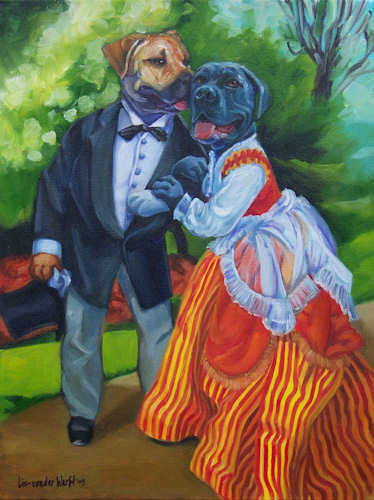 Just one more thing that could have made her painting more complete was a top hat with little slits for her ears. I think spats might have been a bit much, but, maybe for the next painting I'll give it some thought! 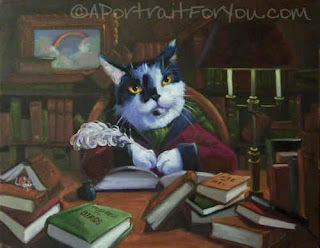 :)"
I love to paint dogs & cats in human settings, remember the "Library Cat" and "Mastiff Masterpiece"
Thanks for visiting - Live Creatively!